How to end the unvirtuous cycle? In the UK and elsewhere, identifying how to successfully reintegrate ex-prisoners and prevent them from re-offending is a major challenge. The prison system in England and Wales performs poorly in this regard, with 45% of all released prisoners reoffending within a year. Beyond simply being a proof of the failures of our prison system, we estimate these offences cost up to £4.5 billion annually, a bill largely footed by the taxpayer. Successful reintegration into society and the economy depends on ex-prisoners securing a good job. Employment provides stability, autonomy and income. But despite schemes to improve the employability of prisoners and practical training offered by prisons to achieve this, in most prisoners are without work upon release. This goes some way towards explaining the high reoffending rate, as without the stable income a job provides, many ex-prisoners find it easy to return to a life of crime. 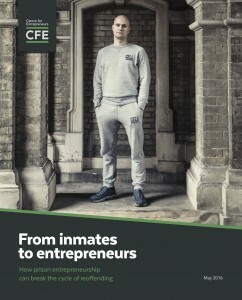 In this report, the Centre for Entrepreneurs investigates the potential of supporting ex-prisoners into entrepreneurship in order to reduce reoffending. Unlike traditional employment, entrepreneurship does not discriminate on the basis of a criminal record, enabling ex-prisoners to pursue the opportunities best suited to their skillsets, attributes and interests while offering them a more flexible environment in which to reintegrate with society. Our report reviews what has already been achieved in this space, including notable initiatives such as the Prison Entrepreneurship Program in Texas and the Leonhard programme in Germany, and Startup and Enterprise Exchange in the UK. We argue that if the government is serious about tackling reoffending, the presence of entrepreneurship programmes across Britain’s prisons must be greatly increased – making specific recommendations as to how this should be done. The report includes original data on prisoners’ interest and experience in entrepreneurship, and fresh statistics on the public savings entrepreneurship programmes could generate. The current emphasis on keeping prisoners in an environment wholly removed from the real world, and hoping they will find a job and support themselves once out, results in great human and financial waste. In an era where self-employment and entrepreneurship are transforming the nature of work, ex-prisoners disadvantaged through conventional employment have much to gain.